In the nineteenth century building world of Great Britain, two journals stand out as the most informative and influential works in the field of architecture. These are The Builder (published weekly from December 1842) and The Building News (published weekly from January 1855). Both hold the enviable record of being among the longest continually running weekly journals on the subject of architecture and building found anywhere in the world. 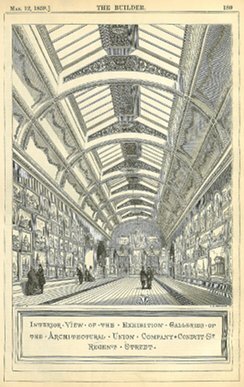 The wide-ranging scope of their coverage of architectural activity in Great Britain, Europe, Asia, North America, South America and even in the far-flung colonies of South Africa, India and Australia makes them unrivaled sources of information and illustrations for literally thousands of buildings. The conception and creation of this website is intended to unlock and make easily accessible the voluminous amount of architectural information published in these sources. Together, these two journals captured the sweeping changes in architectural styles from the Regency, to Gothic Revival, to Italianate, to High Victorian, to the Edwardian, and the Beaux-Arts, and all are recorded with high quality illustrations and exceptionally detailed appraisals and subjective commentary on a breathtaking range of building types. These journals are, in a word, incomparable in the scope and range of their coverage, and they form an extraordinary record of aesthetic and cultural progress not only in the United Kingdom but around the world. This digital index supplements two important books published previously that cover the specific topic of architectural competitions as described in The Builder, as well as a book which serves as a guide to illustrated plates in The Builder. These two works include: Roger Harper, Victorian Architectural Competitions: An Index to British and Irish Architectural Competitions in The Builder 1843-1900, with a Foreword by Sir John Summerson, pub. by Mansell Pub. Co., London, 1983, 416 p. and Robert Thorne & Ruth Richardson, The Builder Illustrations Index 1843-1883, pub. 1994. Both of these books have made a significant contribution in allowing scholars to gain quick access to The Builder for information on competition activity, and to find visual images of key works of architecture in Great Britain and elsewhere in the world. Yet the wealth of architectural information in The Builder, and in The Building News, still lies buried in the weekly descriptive reports on literally thousands of buildings that include churches, schools, hospitals, town halls, libraries, market halls, office blocks, factories, private houses, court houses, hotels, workhouses, monuments, public baths, exhibitions halls, clubs, and even cemetery monuments, public parks, and engineering structures. These articles do not appear to have ever been methodically examined or presented in a digital format in a manner that can be easily used by historians, architects, artists, heritage planners, conservation officers, community heritage groups, students, restoration consultants or anyone in the related fields of research or in the building trades.